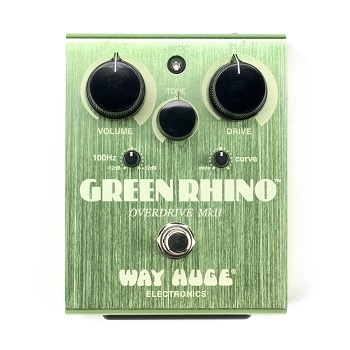 Analog Man carries the Way Huge Green Rhino MK-II WHE-202 overdrive pedal. The Mk II has all the gorgeous classic overdrive that you crave but it has evolved to include cool new features that make it even more rhinoceriffic. The Mk II has all the gorgeous classic overdrive that you crave but it has evolved to include cool new features that make it even more rhinoceriffic. In addition to the Volume, Tone, and Drive controls, you get a 100Hz EQ knob to cut or boost your low end by 12dB. Your low notes can either shake the ground like a stampede across the savannah or cut through the mix like a charging rhino’s horn. This pachyderm of a pedal also sports a Curve control to fine-tune the corner frequencies of your tone. All this amazing tone shaping makes other overdrives seem boring and one-dimensional by comparison. In front of a clean amp, with the Volume and Drive set at noon, you can go from pristine purity to a punchy, dynamic rhythm tone. Set the Drive low and crank the Volume and add tons of boost to wallop the input of any amp. Turn up the Drive control with the Rhino in front of a distorted channel and hear more gain and sustain than you ever thought your amp was capable of.